This program is for real time monitoring of users activities on network computers and for employees' work time tracking. It monitors usage of all office computers in a network. You can see keystrokes, remote screen, Internet history and used programs. Send instant messages, copy files from a remote PC and control them. It can record every email and IM sent and received. Recordings are securely kept in Central Log Database on the main computer. All In One Keylogger implements the state-of-art technology, and guarantees you full control over your computer. Have you ever thought what site your children are surfing when you are not at home? What your employees are doing when you are not at work? Now you can monitor chats,e-mails,keystrokes typed,desktop activities, microphone...It can even send you logs by email/FTP or via your Network. This is Invisible Keylogger surveillance software , Keystrokes Recorder, monitoring Spy Software tool that registers every activity on your PC to encrypted logs. The Keylogger Software allows you to secretly track all activities from all computer users and automatically receive logs to a desire e-mail/FTP/LAN accounting. SPYERA is an application that you install on a mobile phone. After installation, SPYERA secretly records events that happen on the phone and delivers this information to a web account, where you can view these reports 24x7 from any Internet enabled computer or mobile phone. SPYERA PHONE version also allows you to listen live calls, listen surroundings of the target mobile, and to know the location of the device. 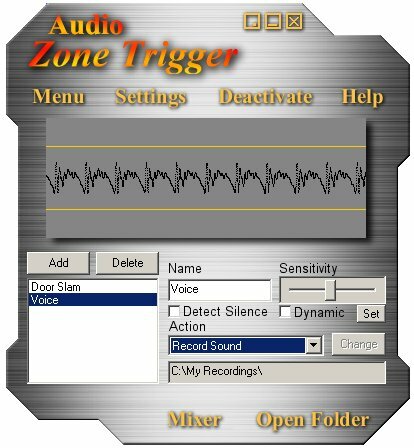 Audio Zone Trigger was designed to do one thing: make the computer react to sound. This simple thing can be useful for home security, house automation, games, experiments, statistics... It lets you set triggers on the sound. Triggers are filters that you put on the sound wave, they put thresholds on them, and perform the actions that you have selected when the thresholds are broken.